Zen Regular Cigarette Filters are economical with 200 filters to roll your own cigarettes and save. Each bag of loose filters includes a resealable zip lock top to avoid spillage. Regular sized for regular sized smokes. 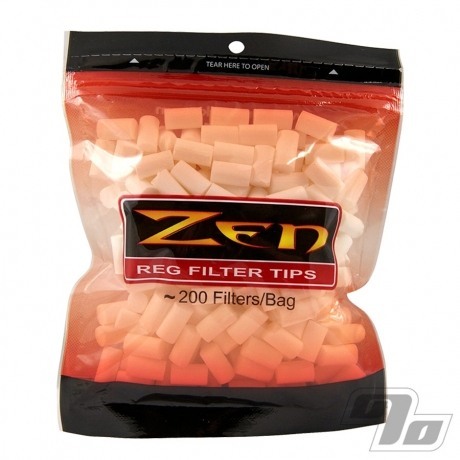 These filter tips are 20mm long and 7.5mm in diameter. Also available in Slim (~6mm) and Superslim (~5mm). Just changed over to roll ur own, love these filters so far. Definitely going to order more. Best filters I have found after 5 years of rolling my own! They do what they are intended to do, enough said. I prefer to double stack them when using king size papers. They draw well, aren't flimsy, and aren't too big. Wish it was 100% cotton, then it would be 5 stars. I agree with the other reviewer. A nice cleaner smoke with less aftertaste. Unlike filters that come in tubes, the Zen filter is easy to insert with a roller and filters a maximum amount of tar, ash, and nasty combustion flavors without impeding nicotine flow. I purchased this to help my roommate who was struggling to find a 'cleaner' cigarette. After rolling a few cigs with the Zen filter, he immediately noted the clean taste of the tobacco. He had lass nasty breath afterwards, and has tasted less tar. I tried it myself. He wasn't joking! No sick flavors of burning paper, tar and combustion by-products. Amazing filters! If you thought your regular rolled cigarettes tasted great, think again. Zen delivers with clean flavor and a crisp smoke EVERY time!